I just had to share this picture from earlier today. Mary Ann, who I work with at the Scleroderma Foundation, brought in this ginormous chocolate glazed donut with jimmies today from Honey Dew Donuts. The donut was surprisingly fluffy and light. The chocolate glaze was yummy. I could only eat a little sliver, but it was a sliver of pure delight. 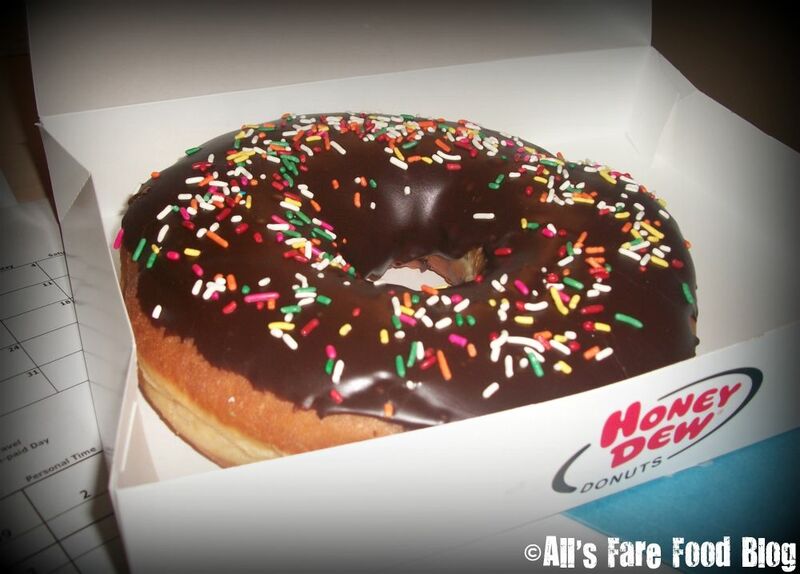 Honey Dew Donuts is a local Massachusetts company that started in 1973. Now, there are more than 140 HDDs throughout New England. A new one opened just recently on Rt. 114 in Danvers near the Foundation’s office. I have yet to go but after seeing this donut – the size of a hubcap – I think I might have to venture in! This entry was posted in Cuisine - American, Cuisine - Desserts, Places - Boston, Places - Massachusetts, Places - New England and tagged chocolate, Danvers, donuts, Dunkin' Donuts, glaze, Honey Dew Donuts, hubcap, huge, jimmies, New England, Route 114, Scleroderma Foundation, sprinkles by Christina. Bookmark the permalink. I just could not leave that in the case…….was totally embarrassed to buy it.